I know. They’re not pumpkin. But in my defense I had this big jug of apple cider to use from when I made the pumpkin butter. Plus, I don’t want my pumpkin hater fans to be upset at TWO pumpkin recipes in one week (although how you can be a pumpkin hater is beyond me!!). Lastly, these are just plain delicious so I don’t know why I have to defend them. The cake-like texture of these are fantastic. In the past I have only made yeast donuts that need to be fried. But these baked doughnuts are a great alternative! I bought my pans online at Amazon. They are Norpro, and they are awesome. I only lightly greased the pans, and the doughnuts popped right out. Not a single sticking issue. So, go make some doughnuts. Today. It’s the right thing to do. And if you don’t have a pan yet, you better get one soon. I see more doughnut recipes on the horizon! In large mixing bowl add flour, sugar, baking powder, baking soda, salt, nutmeg, allspice, and cinnamon. Mix until blended. Add in the apple cider, applesauce, eggs, and vanilla extract. Beat for about 2 minutes until smooth and creamy. Lightly grease doughnut pan (I use Norpro brand). Pour batter into a large ziploc bag, seal, and snip corner. I find this the easiest and cleanest way to get batter into pan without dripping. Bake doughnuts in 325 degree oven for about 10 minutes, until they spring back when touched. Cool slightly before removing from pan. 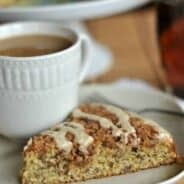 To make glaze, whisk together the apple cider, powdered sugar and allspice until completely smooth. In separate bowl mix sugar and cinnamon. Dip each doughnut into glaze (top of doughnut only) and then into cinnamon/sugar mix. The glaze will down the sides and coat nearly the whole donut. Allow to dry on a cooling rack. Enjoy! Your family looks so Blessed!! Oh I can’t wait to try these! 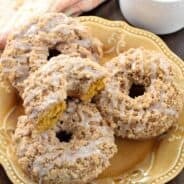 I have a doughnut pan and I made cake-y pumpkin doughnuts last year, but wasn’t a huge fan. I can’t wait to try these; I just bought a jug of cider! These look fantastic!! I just shared on my facebook wall. Thanks for linking up to It’s a Keeper Thursday, I am co-hosting this week, hope you will stop by to say hi. I have always wanted to try those. 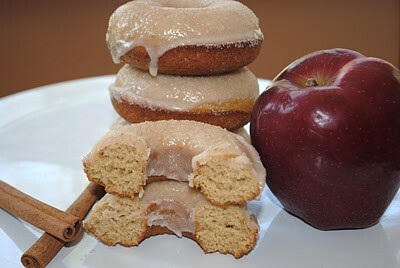 Love doughnuts and apple cider. Yumm!!! Hole cow those look terrific. Found these on Pinterest. Just started following you. Come check out our boards. Tracy- enjoy. The texture is amazing, I want to play around with the flavors now. I loved that these weren’t overly sweet (go figure given all the sugar). I want to use this recipe now as a base for some other flavors! Yumm! I’ve always wanted to make donuts… maybe I’ll try now! Love your recipes. Aimee, can I come live at your house? You make the BEST stuff!!! Your family is so lucky to have such an amazing cook in their home! I have been meaning to try apple cider donuts for so long. Yours look so temptingly delicious. So glad to have found your blog! okay Aimee – I think you’ve convinced me to buy a doughnut pan – I adore apple cider donuts – and I want to make these right now….why oh why don’t you still live next door so I can come sample one? I need to buy some apple cider. It’s the only thing standing between me and these doughnuts! They look delicious! Yum! They sound fantastic! I am going to go buy some apple cider today! Thanks! I love that these are baked! I tried a baked apple cider donut recipe that failed. I’ve bookmarked yours to try out. Sorry I haven’t commented in so long! I have kind of fallen off the blogosphere this summer but, I still have been following and still love your recipes and will be a more devoted follower starting now! Hmm, is there any way to try this recipe without a donut pan? As a cake, maybe? @anonymous- you could certainly give it a try! Let me know how it works!! These are delicious, there still warm in my kitchen! I did a baked donut, but I put it into muffin form, making it a bit less messy. Check it out! 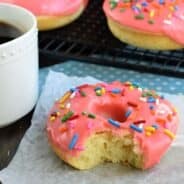 I’ve been searching on line for some decent baked doughnut recipes and the problem I have consistently come across is most of them are baked at too high a temperature or not enough moistness. I can tell by the picture you’ve included with the recipe and by the recipe itself that this is a perfect recipe. You can see the moistness in the doughnut. I’m going to buy my Norpro pans from Amazon also. They have the best deal on doughnut pans. Thank you so much Aimee. Thank you Louise! These doughnuts are delicious. I hope you enjoy them too!